One more year has passed and this month we will be celebrating our 9th Anniversary with all of you! The event will have a duration of 9 days and will start on October 5th! During the 9 days, players will be able to drop Anniversary Boxes and both Kingdoms will benefit from 25% Experience Bonus. In each Day there will be some Random Events during the whole day! All the scheduled events for these 9 days will be canceled. Also, during these 9 days, every player will be able to drop, in game, Lottery Tickets. The Lottery, in-game, will have 2 Rounds: the first one will start on October 5th, and the second one will start on October 11th. Remember that once a player drops a Lottery Ticket, the number associated with it is bound to the Character that dropped it. So, if you sell them or buy them, the number will still be bound to the Character who dropped and the reward (if that is the winning number) will go to the Character that dropped it. Which means that once you drop it, you can destroy it or drop it back to the floor. NOTE: Since the event will have a duration of 9 whole days, the drop rate of the Anniversary Boxes will be moderated to avoid Farming Overload. - A special Forum Lottery will be running during the 9 days, in which people can send up to 10 different combinations. You can send the combinations in my Wall or via Private Message. I will not accept any combinations sent in this thread. During the whole event, every player can send me the best and most creative screenshots. The best 4 will be rewarded! - There will be a new puzzle to solve everyday which will be posted at 14:00 GMT+0! The first player to solve it everyday will get an Odin's Ring. Remember that you have to send me your answer via private message here on Forum. I will not accept any answers given in this thread. During the whole event every player can send me videos of their best moments during Anniversary Event. The best 4 will be rewarded! If you any questions or suggestions feel free to let us know! Any flame or insultuous comments will be removed. Stay clean! We hope you all enjoy this year's Anniversary Event with us! Remember that every Ticket Number is automatically assigned and bound to the player who dropped it! Which means that evenn if you buy or sell a Ticket, that Ticket number will always be bound to the player who dropped it! You can drop the Ticket on the floor or sell it to the General Store once you drop it, its number will always be bound to your character! 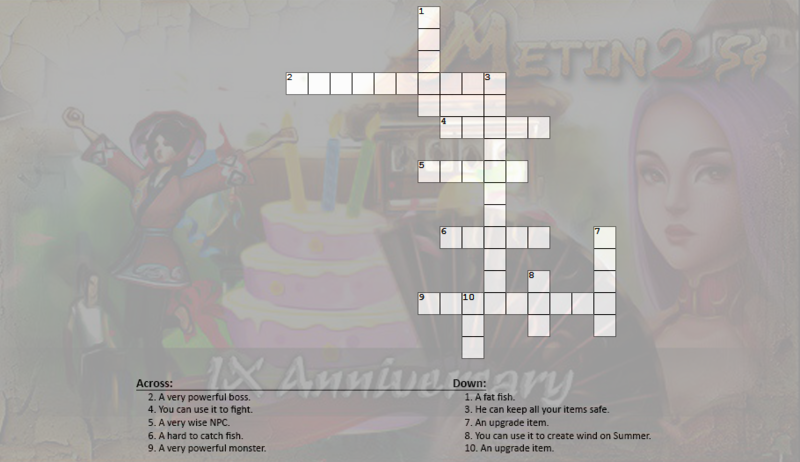 We hope you enjoy out 9th Anniversary Event! The fastest player to send me a private message with all the correct answer will win this event. The reward will be given once the day ends. Don't know if I can ask here but well, here is my question. Is about this. The main goal is to farm the most number of tickets? Like, every ticket has a number (don't know cause i couldn't play yet)? For example I get a ticket with number 22, I drop it and get another with number 40. And so on. And at the end of this first round will be a lottery, and all numbers I got are like tickets of lottery? Also about this. What are the rules? I mean, a 12345 combination like this is good? Or a 12345678910? How many numbers for each combination? Times for day 2 events are in GMT+0? The goal is to obtain the winning ticket, but yes, the more you drop, the more chances you have to get the winning ticket. Did anyone get the puzzle correct or shall we keep on trying ? Majdoline Halawy It seems everyone is finding the puzzle too hard this time I didn't get any correct answer yet. 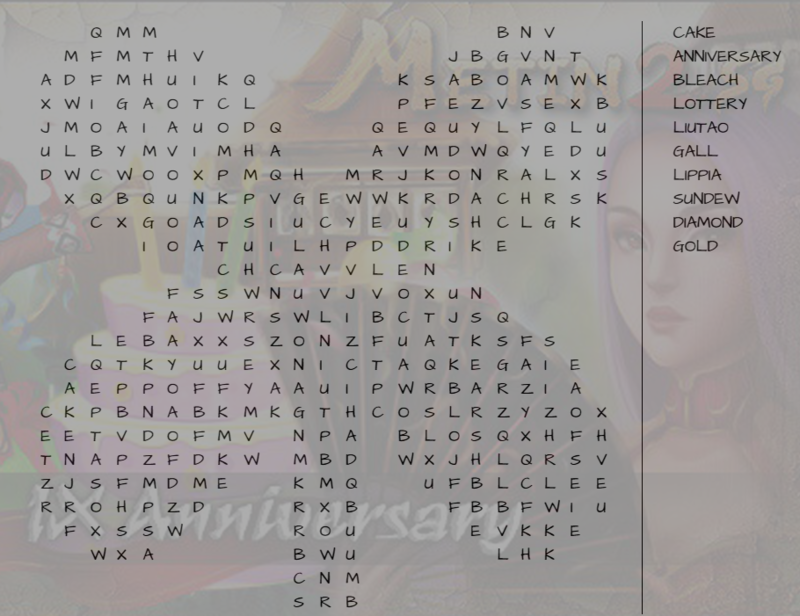 The winner of Puzzle #2 is MrSoon! 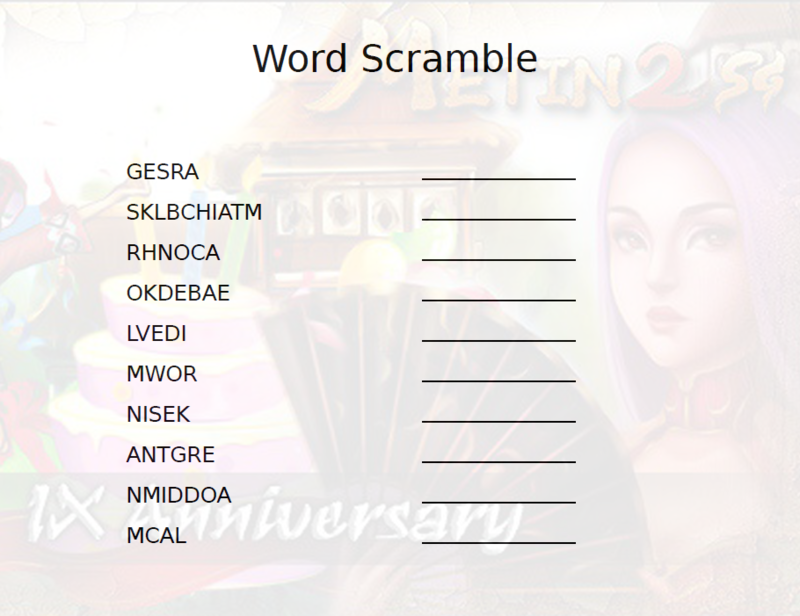 The first player to send me all the 10 correct words will get an Odin's Ring! Remember that you have to send me your answer via private message. I will not accept answer given here in this thread or in my wall. The winner of the Puzzle #3 is xTelsam. The rewards will be sent automatically!